And Irish treasure And Frankish treasure. And German treasure. And Arabic – most especially Arabic. 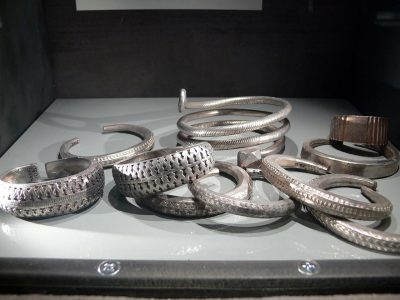 More than 700 purposefully assembled collections, or hoards, of silver treasure have been found on the Baltic island of Gotland, most deposited in the ground for safe keeping during the Viking age (9th through mid-11th centuries). A few of these hoards are of unequalled size, including the largest ever found. The Spillings Hoard, unearthed by a farmer in his field in north-eastern Gotland in July 1999, contains more than 14,300 silver coins, and much silver jewellery: hundreds of armlets, and numerous finger rings, as well as silver ingots, coils of rolled silver, and hack-silver, pieces of broken jewellery and cut-up coinage. The Spillings Hoard was buried under the floorboards of a farmhouse about 881 CE, as the latest coin is dated to then. The house quite possibly was that belonging to a metalsmith – always a prosperous member of society in medieval times – judging by the other metal remains found on site. The earliest coins in the hoard are 6th c Sasanian. The vast majority of the coins are Arabic dirhams, not brought to the island as plunder but rather through the extensive trade around the Baltic basin that connected Gotland with the Silk Road and its fabled riches of silk, furs, and spices. The area where the Spillings Hoard was found abounded in well-to-do savers; a hoard was found in the same field in 1883 and numbered 5,922 coins. Gotland is an island 109 miles long and 32 miles wide in the Baltic sea, and today is home to some 58,000 residents. 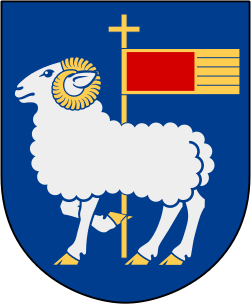 An independent nation until captured by the Danish King Valdemar Atterdag in 1361, Gotland did not become part of Sweden until 1645. 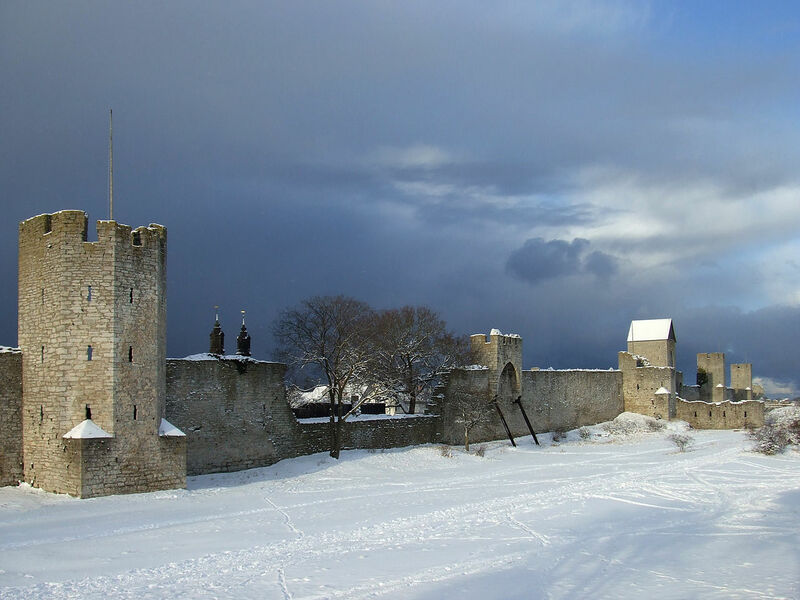 The walled capital city of Visby, on the eastern coast, grew immensely rich in the later middle ages as part of the Hanseatic League, leaving it and all of Gotland dotted with impressive medieval buildings, including the 94 parish churches it is justly famed for. It is a place of exceptional beauty, its extensive coast and many inlets dotted with rauk – wind- and water-swept limestone rock formations – and blessed with the sunniest location of all Sweden. 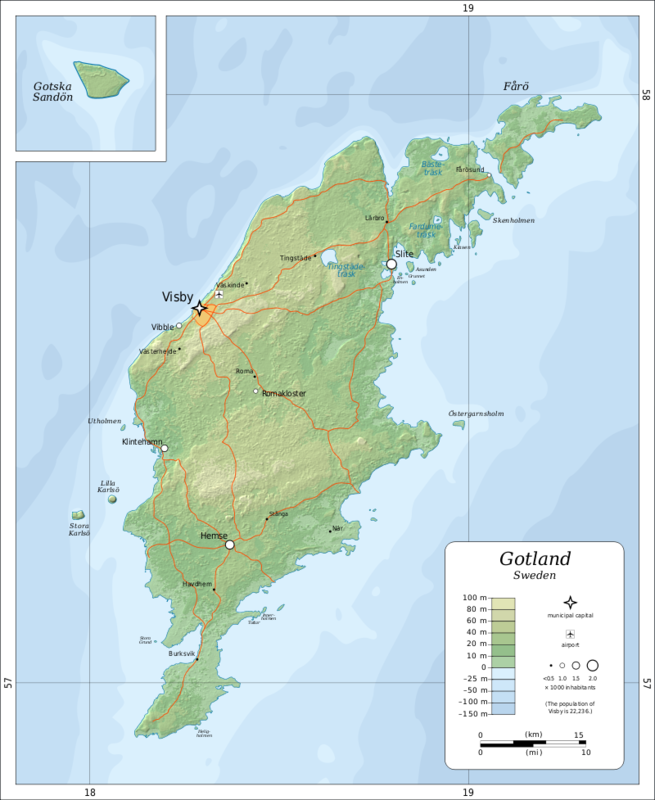 The name “Gotland” – Gutland in Gutnish, the original language of the settlers, is “Goth-land”, land of the Goths. Although the official language politically is Swedish, Gutnish is still spoken amongst some residents, although sadly barely survives in written form. Swedish friends living and studying on Gotland tell me that when they overhear Gutnish it is unintelligible to them, so distinct a language it is. Nearly 200,000 old coins have been found on Gotland, including more late Anglo-Saxon coins than have been found in Britain itself. Yes: more late Anglo-Saxon coins have been found on this small distant island than in England itself. Many of these English coins were almost certainly plunder, and from the payment of thousands of pounds of danegeld (the payments paid by Anglo-Saxon rulers to stave off the predations of the Vikings). But the Gotlanders themselves were not “Vikings” – they were prosperous and peaceful farmers and traders, highly independent, pragmatic, and successful. 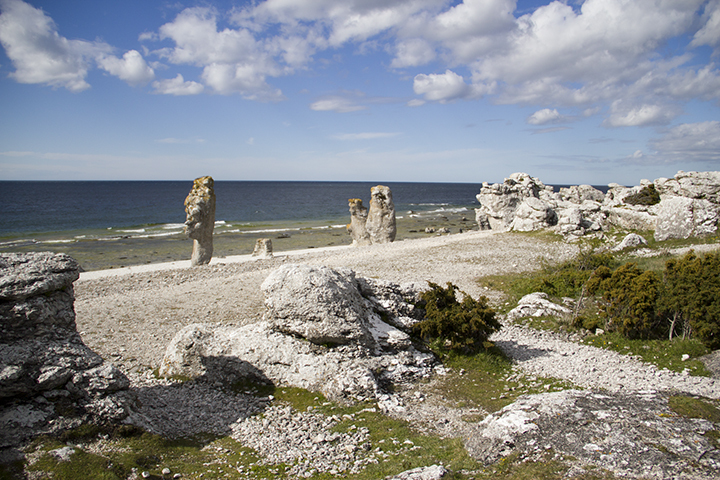 Gotland’s location in the Baltic Sea made it perfect for trading runs across to the eastern and southern shores, where tribes such as the Polanie, Pomerani, and Prus ran Summer trading posts. These connected to trade routes heading further East deep into Russia, South to present day Iraq and Uzbekistan, and West to the great trading towns of the Svear (Swedes) such as Birka, and Aros (Aarhus) of the Danes. The Spillings Hoard, along with much more treasure and examples of Gotland’s famed standing memorial stones, are on view in Visby at the Gotlands Museum. An excellent book is available on the Hoard: The Spillings Hoard: Gotland’s Role in Viking Age World Trade, Visby, Gotlands Museum, 2009.